NOTICE: The light pipe is NOT suggested for clear or translucent shells. LED flashes are already visible through these shells. This is the Base version of the Ultra EverDrive64 v3.X, nothing fancy. This comes with the PCB installed into a gray region free gray cartridge shell with a basic label and held together with phillips screws. Ever dream of having your whole library of Nintendo 64 games in a single cartridge? 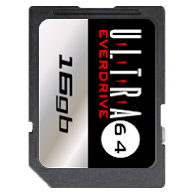 The Ultra EverDrive64 v3.X allows you to load your game back-ups (commonly known as ROMs) on a microSD card, put the SD card into the Ultra EverDrive64, put the Ultra EverDrive64 into a Nintendo 64 and have your list of games at your finger tips. Please read the FLASH CART DISCLAIMER below before purchasing. 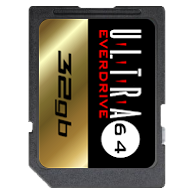 The Basic Edition comes with just the Ultra EverDrive64 v3.X cartridge in the selected style or configuration covered by a 1-year Warranty. Whereas the Deluxe Edition includes the cartridge, a case, printed manual, a Ultra EverDrive64 sticker, Stone Age Gamer sticker, and is covered by a 3-year Warranty. Built-in UltraCIC II lockout chip. Supports both PAL and NTSC systems. Can play protected games, which used CIC-6105. Region free shell. Cartridge fits in any console. GamePak saves do not require reset. SD and SDHC cards are supported. GamePak saves support (SRAM, SRAM128Kbyte, EEPROM16k, EEPROM4k, FlashRam). USB port 800k - 1Mbyte/s. USB port useful for developers. This is a great product that can play any N64 rom on your TV. What's not to love? Unfortunately I had to deduct one star because the SD card that comes with it had some compatibility issues. Basically, upon resetting the N64, or sometimes even powering off and back on, I would get an error message on my TV: "Everdrive 64 - bootloader v4 Error: F0." In order to fix it, I would have to reformat my SD card and reinstall the everdrive OS, as well as my roms. 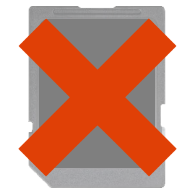 After doing some research on the Everdrive forums on the Krikzz website, I learned that this tends to happen with newer SD cards, specifically ones with the roman numeral 1 on the front of them. The reason is because the internal processing speed of the SD card is faster than the speed of the firmware on the Everdrive 64, so the Everdrive cannot keep up with the SD card and gets the error message. In order to fix this issue, I started holding the reset button on my N64 upwards of 10 seconds or more in order to let the Everdrive's speed catch up with the SD card. This worked and I have had no more errors since! 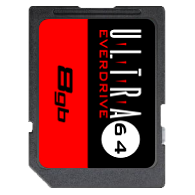 1) Unlike emulators, such as project 64, the Everdrive 64 requires that you unzip the roms first, before you copy them onto the SD card. Otherwise they won't play and you will receive a message - "Please unzip rom" - or something like that. 2) When using the Everdrive 64 in your N64, DO NOT mess with any of the icons in your ED64 folder, such as the OS.64V64. I also got an error from doing this and had to reformat the SD card. Despite all of the technical issues, I absolutely love this device since I've gotten it working. The N64 is probably my favorite system ever and I'm having a blast replaying tons of games that I lost years ago on the actual system. One thing I would recommend for the StoneAgeGamer to do is to send a manual with it as well. Customers who are less tech-savvy than me may get frustrated by not being able to get it running and want to send it back. I would have appreciated it a lot when I was dealing with all the errors from the SD cards. Other than that, it's a great device and I'm glad I got it working since it was so expensive.